You don’t just want to generate more leads. You want to generate better leads with lead generation techniques that actually work! Highly qualified leads are easier to convert. But figuring out how to get more high-caliber leads is always a problem. Buying bulk leads from a company never works. Stop wasting your time and money on poor quality leads. Increase profits by cutting the time to conversion and attracting customers that spend more. That’s what these lead generation techniques the pros use are all about. Traditionally, it’s called a sales funnel. You might think of it as the buyer’s journey instead. However you picture it, the more seamlessly you can lead people from point A to point B to point C, the more cost-effective and efficient your lead generation will be. Let’s look at how to create an effective funnel. A funnel starts with building brand awareness. This is about establishing a presence where your target is. This presence should become a magnet drawing in the customers you’re targeting. It may be an organic magnet like posting things on Facebook or managing a blog that has great visibility in searches. Or it may be paid using social media ads, AdWords or other display ads. Social media is the most common and effective way to reach people at the top of the funnel. Whatever it is, like all lead generation ideas, the message should be very targeted and goal-oriented. Convert that lead like a pro with less time and effort. In the mid-funnel, “capture the lead”. Capturing the lead gives you a clear way to follow up and seal the deal. Your top of funnel leads to a landing page or form. Put a single call to action on it. This CTA prompts the lead to provide contact info like an email. In exchange, give them something of value. It might be a free upgrade, chance to win something, a detailed report, or a free trial. This is where you spend your more focused time and effort. If you’re bringing the right people into the funnel, costs will be lower at this stage. As with a funnel you use in the kitchen or garage, the bottom of the funnel is narrowed. You have fewer leads you’re nurturing than you did at the top. People who get to this part of the funnel are very likely to convert. It’s worth your time to personalize and nurture them into not only new customers but repeat customers and advocates for your brand. Companies that nurture leads on average have 50% more sales for about 33% less cost. Nurtured leads spend 47% more money. Without nurturing, 79% of leads never become customers. That defeats the purpose of your lead generation process. Both customers and businesses prefer email marketing as a primary lead-nurturing strategy. Unlike any other method, technology makes it easier to automate and send highly relevant content to leads through email. We’ll discuss this in more detail in the next section. You may have a handful or a dozen funnels. But each of them will funnel into a single lead-nurturing location like a subscriber list. Once you’ve established what your funnels are, it’s time to look at how your lead generation techniques are working. One of the easiest ways to track top and middle funnel effectiveness is in Google Analytics and social media analytics. They are both free. Free is good. How many like, share, watch the video, etc. Your website may offer a poor experience. In these cases, identify the cause for the leak and fix it. Next, we move into mid-funnel. Did you capture that contact information the funnel is set up to collect? You can easily track this in Google Analytics by setting up funnels there. 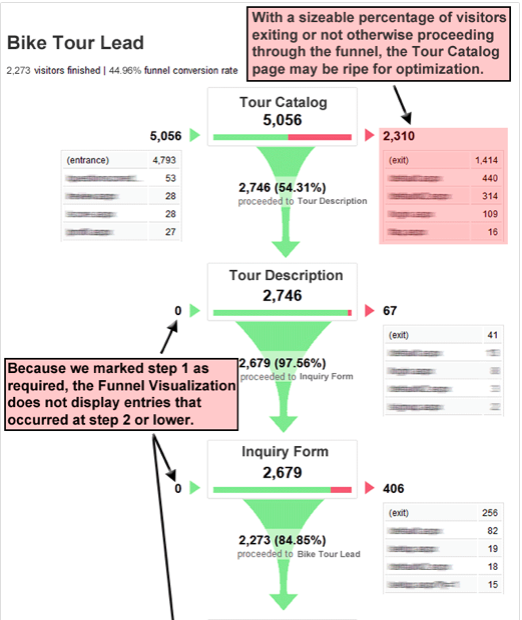 Just tell Google what page represents what stage of your funnel. The final stage of your funnel may be a thank you page after they provide an email. Marketing software company Kissmetrics offered a great visual for a funnel. In this case, the funnel started with an online catalog. Once you set up your funnel in Google Analytics, see how many people the funnel is bringing in. What percentage are converting to leads? If your conversion rate is low, you may need to work on your landing page or lead capture form design to reduce the number of people falling out of the funnel. What happens here tells you how effective your overall funnel is. Sometimes people get into the bottom of the funnel. Then you have a low percentage that convert to paying customers. If you’ve ever worked in sales, you know what’s its like when the marketing department is sending you poor quality leads. It’s frustrating. When a funnel is done right, this doesn’t happen. As a small business leader, you have control of the quality of leads coming into that funnel. And you manage what happens to them inside the funnel. If you’re having trouble converting leads once they’ve reached the bottom of the funnel, it tells you one of two things. Either you’re not very effectively nurturing leads once they reach this stage. Or you’re bringing people into the top of the funnel who aren’t your ideal customers. In most cases, it’s a bit of both. Ideal customers are easy to convert once they reach the bottom of the funnel. They want what you have. The ideal funnel is a no-brainer. Simplicity will both make it easier for your web designers and the customers. Use what you’ve learned from analytics to maximize your results. 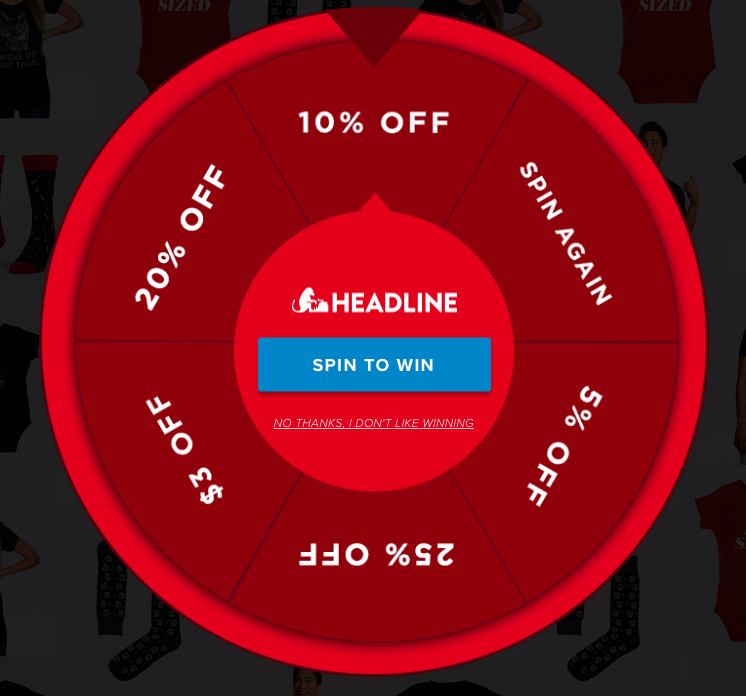 Here’s an impressive lead generation funnel from Headline Shirts, a small B2C T-shirt company. It all starts with a great ad. This one appeared on a news website. But it would also make a great social media ad. Once clicked, you instantly go to a mini-game widget on their website. “Spin to Win”. That sounds like fun. There’s actually no chance involved though. Every time we spun, we got the maximum 25% off. On a B2C product like a T-shirt, 25% off is just enough to make most people want to claim their discount. This helps ensure the visitor feels they’re getting a great value. But before you can claim it, they request your email address. Lead captured. 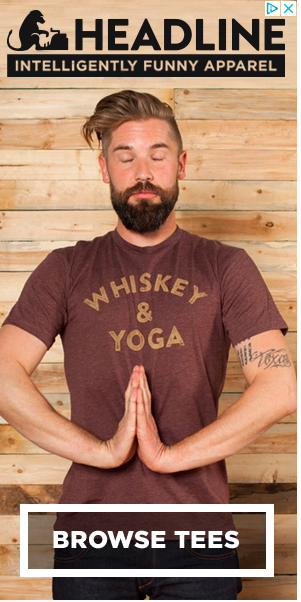 Even if you decide not to buy a T-shirt now, they still have your email. They can start sending relevant content to your inbox. Straightforward. Fun. Offers something of value. This is how simple effective lead generation techniques can be. 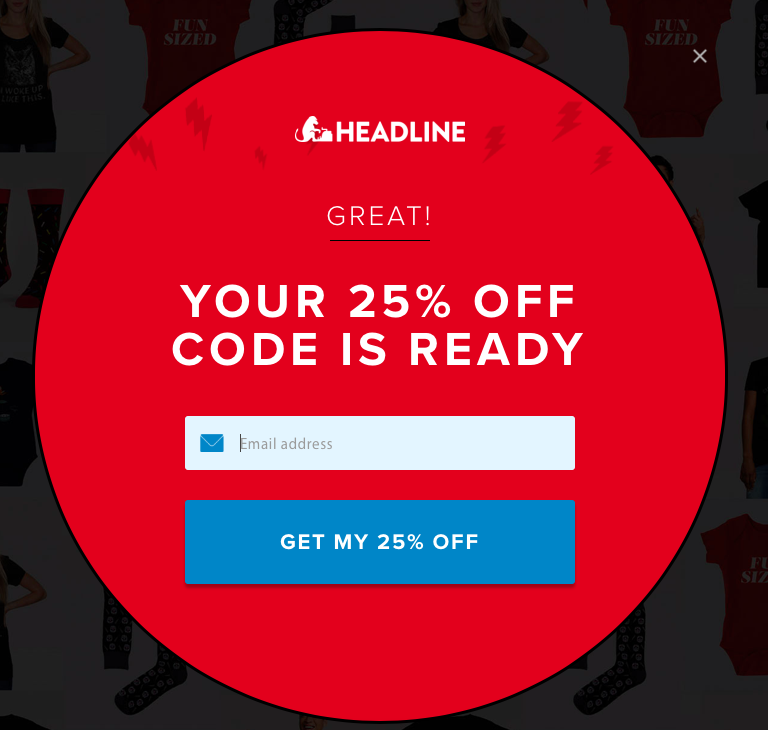 Now, imagine if they offered every website visitor 25% off without setting it up to capture an email. Would this have been as effective? Lead generation through sales funnels involves thinking about the long term benefits and reclaiming missed opportunities. Leads aren’t every person that follows you. They’re not someone who shared a post. It’s not everyone that visits your website. When you have a clearer understanding of what qualifies as a lead you’ll know when you have one and what to do with it. Establish clear criteria for what you consider a lead to be. What is a highly qualified lead to you? Knowing what these leads look like will help you improve how you attract them. Sometimes leads don’t come in through your established sales funnels. These may still be leads if they’re showing great interest in your brand. For example, some people prefer to keep themselves at a distance. They may comment on what you share but not even follow you. Interact with people who comment on social media. Encourage more comments. It shows that people like your brand. These casual commenters, when nurtured often convert and become brand promoters. To get more leads that generate high conversion rates, the pros focus on personalizing content to make it more relevant for these leads. They do this through the process of segmentation and automation. With segmentation, you gather data about your leads. Use this data to direct the most relevant content to that lead. Studies show that segmentation significantly increases conversion rates. People buy more. They’re more likely to share. They’re less likely to mark your email as spam. Automation software to reduce monotonous, repetitive and time-consuming tasks. It allows you to respond via email at the optimal time even if you’re asleep. What if someone signs up for a mailing list, stops watching a video on your site abandons a cart or complains? You don’t want to wait a few days to respond. Automation allows you to respond automatically via email to the events you choose with pre-planned content. Turn your social media profile into your top lead generator. Build your presence. You may use another tool at the top of your funnel. But you still need the social proof that social media provides you. Social media, unlike any other method, allows you to show your best face to the world. But building a social media presence is more than just having a profile and sharing things. You need a strategy and a method to build your following. Here’s how to build a social media presence that you can leverage to generate leads. Thoroughly complete your business page if the site has different profile types for business. These not only set you apart. They give you access to business tools like lead-generation forms, analytics and ad types you may not have with a personal profile. Share and comment in groups where your target customer hangs out. This will help build brand awareness and may generate direct leads. Network with other industry influencers. This could provide you with a collaboration opportunity. Encourage customers to create content and tag your brand. Share this content on your site. Curate content from people you know that your target respects. Create your own content and share it on social media. Add compelling captions. Try to start a conversation. Become active and add value. You can have a great profile and share. But often no one sees you. Using social media advertising strategically to make people more aware of your brand and social media profile is the fast and effective way to create a strong presence. Run a promoted contest that your target will love. Promote posts that your existing followers like. Use social media’s targeting tools to precisely target your most likely customers. Get people interested in your brand. Consumer behavioral science says that the primary reason anyone buys anything is because they have a goal to meet. They may want to save time or money. They may want people to like them. They have a specific challenge that the product or service solves. New business owners often think it’s obvious. A person hires a tree-trimming service because they need a tree cut down. But this is a very surface level need. It’s valid. But what do the customers really want? What about this need may actually connect to an emotion. To provide have better luck with the garden because it’s getting more light. The list goes on. But it’s important not to assume you know what they want. Some of these goals may be more lucrative than others. Lead generation techniques that generate conversions are data-driven. Through data, you learn not only what customers want. You learn which customers are most likely to hire you with less effort from you. Which ones spend the most money? Which ones are likely to share you with their friends? With this knowledge, focus your lead generation efforts on leads that are cheaper, faster and easier to convert. That means you make more money at the end of the day. You can use free tools like Survey Monkey Basic and Google Analytics. But you’ll get more out off paid analytics tools when you’re ready to make that investment. Compile this data to create a pretend customer profile built around each need. In digital marketing, we call these Buyer’s Personas or Customer Avatars among other names. When building content around your lead generation techniques, have these written profiles in hand. Create that content as if you’re speaking directly to that person. That leads us to the next point. We’ve all seen blog topics like this one. 10 reasons you need to hire a digital marketing agency. There’s nothing wrong with having a topic like this on occasion. It may serve a purpose within greater content goals. But it’s really a blog topic in reverse. It automatically sounds like the content’s purpose is to sell you something. Lead generation techniques should always focus on what the customer wants first. That’s how businesses get what they want. Not the other way around. You’re reading about these lead generation techniques to generate more lead conversions from those leads. You’re probably not reading this article because you want to know what we’re going to try to sell you. Add real value first to generate more high-quality leads. When creating this content among your lead generation techniques, research thoroughly to add the most value. Anyone can give an opinion. And your opinion may matter more than most because you’re an expert in your field. But it still needs to be supported by data. The more unique and information dense — while still being interesting — the data is, the easier it is to generate quality leads. Share content created by both your customers and other people in your industry. This helps show that it’s not all about you. At the same time, it makes it more cost-effective to engage. Curated content is less expensive than content that you create. But be careful not to overdo it. You need enough original content in their to clearly establish your brand message. SEO (search engine optimization) at its core is about aligning your website with a search engine’s goals. In most cases, we’re talking about Google. It has about 90% of the search engine share. So what are Google’s goals? Google wants to stay the top search engine in the world. To do that, it needs to deliver what its own customers want. They’re the secret to its success. Who are Google’s customers? They’re people searching for things on Google. 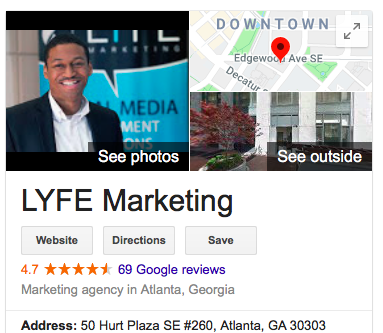 When Google can deliver exactly what a person wants quickly in those top 3 results, they’ve made their customers happy. Just think about your own use of search engines. Google’s impressive search algorithm has made it faster and easier to do things that would have taken days just 20 years ago. Even in the past 2-3 years, it’s gotten so personalized that you can find almost anything you’re looking for in one search. In many cases, they can show people what they’re looking for without asking them to click on anything. The pros know that if they want to earn one of those top 3 spots in a Google search they have to align with Google’s primary goal. Over 50% of search traffic goes to these top 3 spots. With great SEO strategies, capture leads at the very moment they’re looking for what you offer. To align your site, demonstrate to Google that you have the best answer to a person’s query. Showing you’re the best happens at both the website and the page level. You also need to show that you’ll provide the best experience. Google determines this by how people interact with your website. If they click and then leave fast, that doesn’t look good. If they don’t click on anything, this also doesn’t work in your favor. Google is watching not only which website gets clicked but how they interact with your website. Here’s the step-by-step to SEO lead generation techniques. Make it as fast as possible. Organize images, videos and text so that people can easily find what they’re looking for. Avoid excessive distractions. You may be tempted to expand your site out to 500 pages fast. But each of those 500 pages needs to be quality pages. Otherwise, Google won’t even index the page. This means the page is invisible in searches. On top of this, humans are sensitive to poor quality pages. When a page is full of typos or not helpful, people feel slighted. You just wasted their time. They won’t be coming back. They certainly won’t become a paying customer. Know what your competition is doing. Do a manual analysis or invest in paid tools to get more usable data with much less effort. This is one area where the expertise and resources of a digital marketing agency will save you a lot of time and money. Use this knowledge you acquire from your spy efforts to build strategies that counter their efforts. Instead of recreating the wheel, see what’s working for them. Do it better. Google’s a lot smarter about understanding what’s on a page than it used to be. But it still primarily relies on keywords to understand what the page is about. It takes this understanding of the page as it attempts to deliver the most relevant search results to a person. Use keyword tools to identify which keywords people are actually using to find sites like yours. Spy on the competition to find out which words they’re using on their top pages. Paid tools like SpyFu or Moz make this an easier process and provide insight you can’t get manually. Top ranking pages demonstrate that they cover a topic in depth by using LSI (latent semantic indexing) keywords. This is a list of words that relate to the page topic. We can’t name SEO among the top lead generation techniques that generate conversions if we’re not concerned about the traffic quality. You may begin applying your keyword strategy and creating content only to find that your traffic isn’t converting. Use analytical data to determine what’s working. Adapt based on that data to streamline the lead generation process. One of the best ways to demonstrate your site’s authority is through votes of confidence from similar websites. The higher authority these sites have in their own right and the more closely the page aligns with what you do, the better. Is relevant — the context of the link is relevant. The website, page and/or paragraph have language in them that relates to the page it’s linking to. Is do follow — Websites have the option to put “no follow” in their code. When they do, the link provides referral traffic. But it doesn’t directly help the authority of your website.